Over the past year I have really developed a deep-seated love for Spanish wines. It could be because I spent time there at the beginning of 2014, visiting with some of the top winemakers in the country, or it could simply be that I’m finally tasting the right Spanish wines. When most people think of Spanish wine they think of words like “inexpensive”, “overripe”, and “uninteresting”… Oh my God they couldn’t be more wrong. In my opinion some of the best wines in the world are coming out of Reino de España. Wines like Pingus by Peter Sisseck, L’Ermita by Alvaro Palacios, Lopez de Heredia Bosconia Gran Reserva, Hermanos de Peciña Gran Reserva and Vendimia Seleccionada, Muga’s Torre Muga, Clos Erasmus Clos i Terraces, Martinez Lacuesta Reserva Especial… the list goes on, and on, and on. I have recently had the pleasure of drinking a 1947 Lopez de Heredia Bosconia Gran Reserva, 1968 La Rioja Alta Reserva 904 and a 1968 Lopez de Heredia Tondonia Gran Reserva Blanco (yes, a white wine from 1968!) and they were all life changing. Spain should not be thought of as the country of cheap wines, they should be considered a veritable winemaking super power! While many of the wines I mentioned above are moderately (or extremely) price prohibitive, there are also a ton of great wines from Spain that are very easy on the bank account. 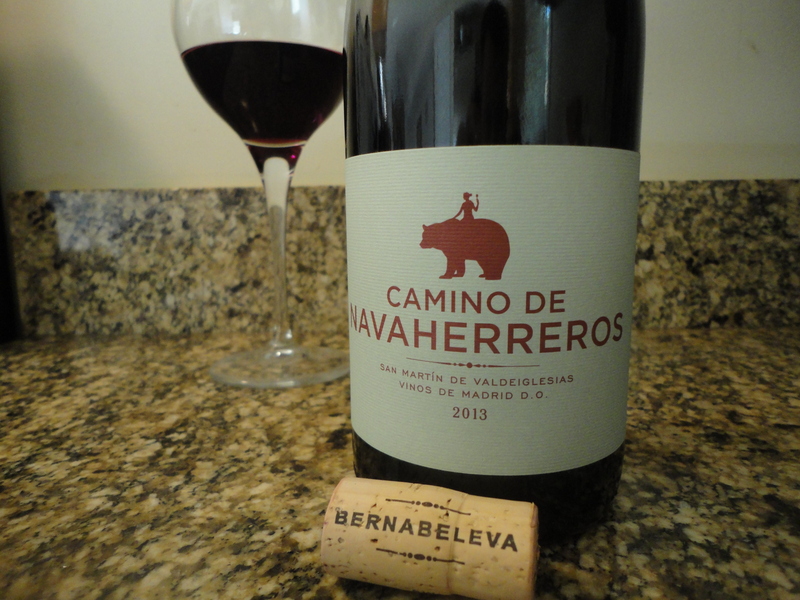 One such wine is the focus of this article, Bernabeleva’s 2013 Camino de Navaherreros. Bodega Bernabeleva is a relatively new producer, hailing from the village of Pelayos de la Presa in the San Martin subzone of the Madrid DO. Let’s face it, the Viños de Madrid DO has a bad reputation for wine, and rightfully so. A vast majority of the wines coming out of there are subpar, and most are of the jug variety. However, San Martin de Valdeiglesias, found along the western edge of the appellation, is the exception to that rule. San Martin is a small, hilly, higher elevation region with a number of old vine parcels, and there are a handful of winemakers doing some pretty great things out there. Bodega Bernabeleva is the best of them. The Camino de Navaherreros is their entry level wine, and one of the best kept secrets coming out of Spain. In fact, for years this wine never left Spain as it is in very high demand among the tapas/wine bars of Madrid, San Sebastian, Barcelona and Sevilla, and with only 3,300 cases made per vintage there was none left to spare for anyone else. International pressure finally won out though, and now a small percentage of their production trickles out of the country. Fewer than 500 cases see their way to the U.S. every year. The Camino is 100% Garnacha from their younger vines and sees nine months of aging in a combination of stainless steel and large upright wooden vats. On the palate the wine is bright and vibrant, with distinct notes of tart cherry, raspberry, blood orange, pantry spice and cedar box, framed by moderate acidity and grippy tannins that settle as the wine breathes. This is ideal as an aperitif, or with poultry and other lighter fare. In blind tastings it is often confused with Pinot Noir or even Cru Beaujolais, which is something that is never said of Garnacha! You may have some difficulty finding this bottle in your local shop, but there are a number of boutique wine driven retailers offering it online, so just let your fingers (and credit card) do the walking. Do yourself a favor though, don’t buy this by the bottle… buy a whole damn case. You’ll thank me later! Just don’t ask me why there is a woman drinking wine while riding a grizzly bear on the label… I haven’t a clue. Tags: espana, garnacha, madrid, perfect pairings, perfect pairings at home, san martin, spain, spanish wine, vina, wine. Bookmark the permalink. Previous post ← How to roast garlic… super easy!